Black Hammer is finally ready to launch! Coming in JULY 2016 from Dark Horse Comics! BLACK HAMMER follows a group of oddball superheroes who have been "wiped out of continuity" after an earth shaking cataclysmic "event" and wake on a farm in a mysterious small town. They were the greatest heroes of a lost era, Golden Aged crime buster, ABRAHAM SLAM, interstellar adventurer COL. WEIRD and his robot sidekick TALKY-WALKY, BARBALIEN warlord From Mars, GOLDEN GAIL, America’s super-sweetheart, MADAME DRAGONFLY, mistress of the macabre, and BLACK HAMMER invincible champion of the streets. They have no idea where they are or how to get back home. All they know is they can't leave the borders of the seemingly idyllic small town. The book follows the strange cast of characters as they work to assimilate themselves into quiet small town life, living as a bizarre surrogate family on the farm, all the while try to uncover the many mysteries of the farm, where they really are and how to get back home. 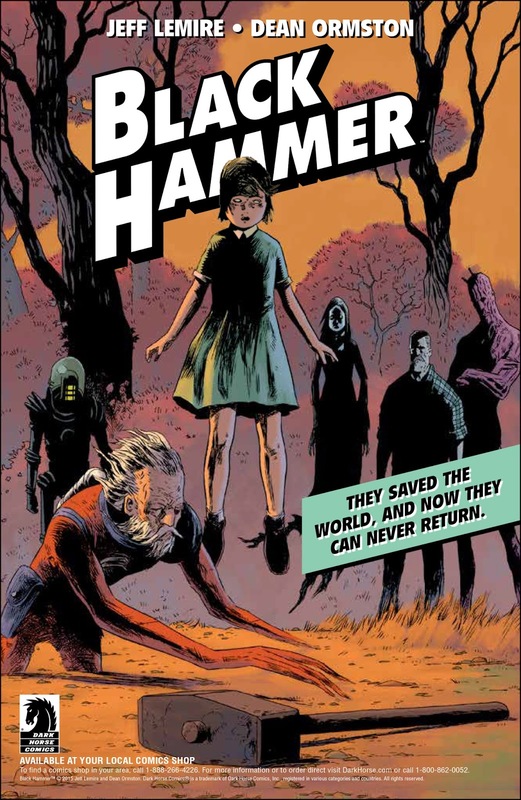 Written by Jeff Lemire and Illustrated by Dean Ormston, Black Hammer also features colors by Dave Stewart and Letters by the legendary Todd Klien.